Directors – Jake Castorena & Sam Liu, Screenplay – Peter J. Tomasi, Based on the Comic-Book by Dan Jurgens, Louise Simonson & Roger Stern, Producers – Sam Liu & Amy McKenna, Music – Frederik Wiedemann, Animation – Studio Mir. Production Company – Warner Bros. Animation. Clark Kent is now involved with Lois Lane. As his step-parents, the Kents, visit Metropolis, Clark takes Lois to meet them but anguishes over whether or not he should tell her that he is Superman. At the same time, an asteroid appears from space, demolishing a space shuttle and then landing in the ocean. As both Lex Luthor and the Atlanteans send people to the underwater crash site to investigate, a creature emerges that demolishes everything in its path. The Justice League go up against the creature and are defeated. Superman comes to the fight but in doing so faces his toughest opponent yet. The Death of Superman (1992-3) was the top-selling DC comic-book of all time. Spread over seven different titles with threads that ran through thirty different individual stories, it sold some three million copies and is still the third top-selling individual comic-book of all time. It produced a sea change in the comics industry with both DC and Marvel switching to a series of Big Event stories wherein major characters were killed, resurrected or incapacitated on a regular basis. The Death of Superman is such an influential storyline that it has been adapted to film no less than twice before this in the previous animated film Superman: Doomsday (2007) and in the live-action Batman V Superman: Dawn of Justice (2016). This is the first of a two-part adaptation of The Death of Superman made as part of the DC Original Animated Movies line. 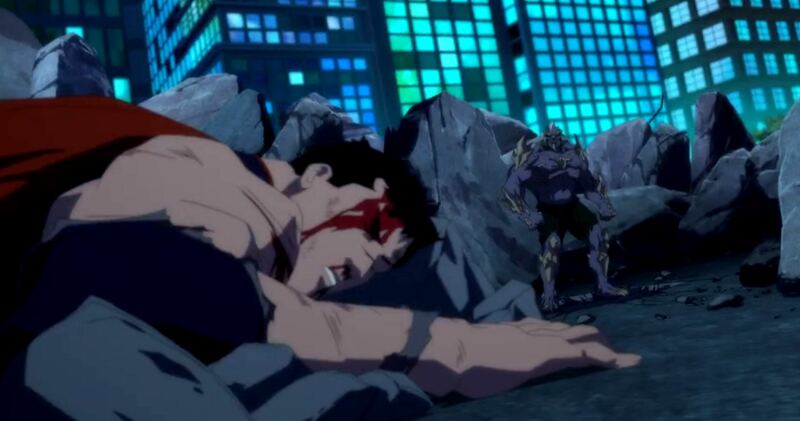 The story culminate in The Reign of the Supermen (2019), which deals with the after-effects of Superman’s death and the series of impostors who emerge. The other DC Original Animated Movies consist of These have included Superman: Doomsday (2007), Batman: Gotham Knight (2008), Justice League: The New Frontier (2008), Green Lantern: First Flight (2009), Superman/Batman: Public Enemies (2009), Wonder Woman (2009), Batman: Under the Red Hood (2010), Justice League: Crisis on Two Earths (2010), Superman/Batman: Apocalypse (2010), All-Star Superman (2011), Batman: Year One (2011), Green Lantern: Emerald Knights (2011), Batman: The Dark Knight Returns Part I (2012), Justice League: Doom (2012), Superman vs. The Elite (2012), Batman: The Dark Knight Returns Part II (2013), Justice League: The Flashpoint Paradox (2013), Superman Unbound (2013), Batman: Assault on Arkham (2014), Justice League: War (2014), Son of Batman (2014), Batman vs. Robin (2015), Justice League: Gods and Monsters (2015), Justice League: Throne of Atlantis (2015), Batman: Bad Blood (2016), Batman: The Killing Joke (2016), Justice League vs Teen Titans (2016), Batman and Harley Quinn (2017), Justice League Dark (2017), Teen Titans: The Judas Contract (2017), Batman: Gotham By Gaslight (2018), Suicide Squad: Hell to Pay (2018) and Justice League vs The Fatal Five (2019). This is also an adaptation of The Death of Superman made to fit in with the DC Original Animated Movies’ adherence to DC’s current The New 52 comic-book continuity (even though the original The Death of Superman comic predated The New 52 by two decades). All of the Justice League get their new updated uniforms, especially Wonder Woman in her unappealing red and navy blue designs; Batman makes reference to having to be back for Damian’s PTA meeting; Superman and Wonder Woman have a scene discussing their past relationship (although this differs from the comic-book The New 52 where Superman and Lois are not involved – here a substantial portion of the story arc is about Superman anguishing over whether to reveal his secret identity to Lois). The Death of Superman is a solid DC Original Animated Movie. Some of the more recent entries have been a little lacklustre, principally due to director Sam Liu, who is notedly relegated to co-director position here. The plot is on the slighter side – there is not too much more to the latter half than the Justice League (but mostly Superman) and Doomsday beating the crap out of each other. The one thing that the film gains that the original comic-book did not have is the whole story arc about Lois and Clark being involved and his decision to reveal his secret identity to her just before the attack by Doomsday (something that had predated The Death of Superman event by a year in the comic-books). Even though you feel as though the film could have given more in the story department, Sam Liu and co-director Jake Castorena, a former storyboard artist on various DC animated films and tv series who had previously solo-directed Scooby-Doo & Batman: The Brave and the Bold (2018), create some epic-sized superheroic action that thrill in all the ways it used to back in the era of the various Bruce Timm tv series. The actual scenes of Superman’s death are played for all the epic pathos that the film can wring out of them.